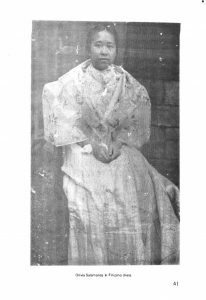 Olivia Salamanca was one of the 37 Filipino students who were appointed scholars by the Philippine Government to study in the United States in 1905. There were two other girls beside her. There should have been four of them, but the fourth, who obtained the highest rating in the examination, turned out to be only 12 years old, and 16 was the minimum age required by law. Her name was Felisberta Asturias. The feminists at that time must have rejoiced over her memorable feat..
Luckily the parents of Olivia Salamanca, unlike many Filipi­no parents at that time, were willing to permit their daughter to study in that faraway country, then little known to the Filipinos. …The Caviteños had a right to be proud of her: the first Cavi­teña, to the best of my knowledge, to obtain the degree of doctor of medicine and the second Filipino woman to hold that high distinction. She was one of the charter members and the first secretary of the Philippine Antituberculosis Society which was founded on 29 July 1910. Towards the end of the same year she was found to be suffering from tuberculosis. About the diary: The Philippine Diary Project includes the extracts from the diary included by Encarnacion Alzona in her paper. In it she mentioned that some of the entries came from a typewritten copy, incomplete and damaged: “Her diary for 1910 and 1913 in my possession is incomplete.” The article does not mention how or where she came across the diary, or any other details about it. It is to be hoped that at some future date Dr. Alzona’s heirs might be contacted so an inquiry can be made. The full paper of Dr. Alzona is available on line.